We’ve been telling jokes about Sherlock Holmes since the beginning. The earliest send-ups of the world’s greatest detective appeared not long after Arthur Conan Doyle started publishing his stories about Holmes and his trusty sidekick, Dr. John Watson, in The Strand Magazine, and by the early decades of the 20th century, the comic strips and humor sections of newspapers and magazines on both sides of the Atlantic were swarming with Picklocks, Shamrocks, Herlocks, and Shylocks. In all likelihood, “Elementary, my dear Watson,” that most apocryphal of catchphrases, started out in a joke; it never appeared in any of Doyle’s stories, nor in the original version of the hit stage play that first gave Holmes his deerstalker hat and calabash pipe. Mark Twain wrote parodies of the Holmes mysteries, as did O. Henry and P.G. Wodehouse. The Sherlock joke is one of our older pop culture institutions, like Holmes himself. This is especially true when it comes to film, where depictions of Sherlock Holmes are said to outnumber those of Jesus Christ and Count Dracula. In fact, the earliest Holmes films are parodies, predating any official adaptations of the Doyle stories—the best of which have always had a good sense of humor. But if there are any new jokes left to tell about Holmes, they’re nowhere to be found in the abysmal Holmes & Watson, which might be the worst feature-length film ever made about the “consulting detective” from Baker Street. 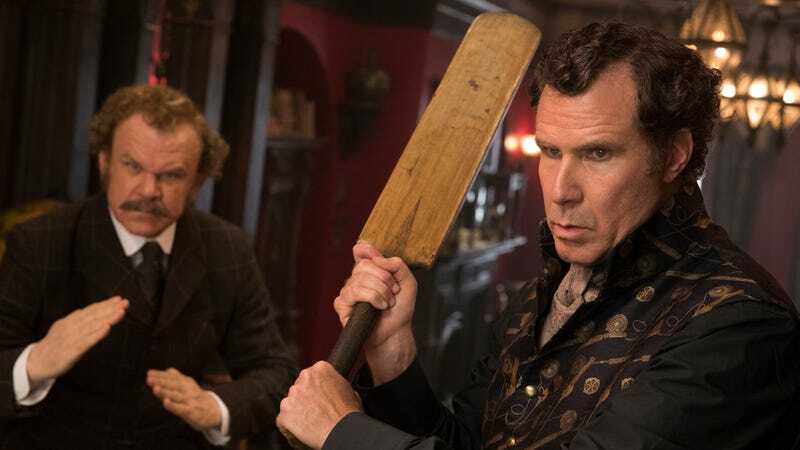 The movie is 89 minutes of inertia and pure, undiluted flopsweat, with a couple of uncharacteristically unfunny and painfully awkward lead performances from Will Ferrell (as Holmes) and John C. Reilly (as Watson). 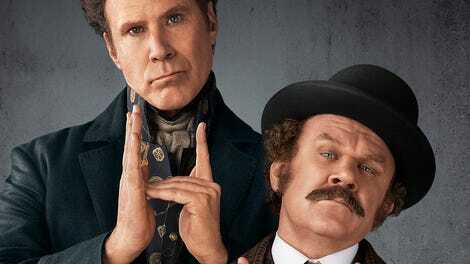 Written and directed by Etan Cohen (not to be mistaken for Ethan Coen, under any circumstances), Holmes & Watson imagines the title characters as a couple of needy, middle-aged manchildren—though the similarities with Ferrell and Reilly’s work together on Adam McKay’s Step Brothers end there. Struggling with objectively awful English accents, the two actors spend their time on screen dragging out terrible jokes, as though trapped in the improv-exercise equivalent of eternal damnation. Though it’s mostly the audience that suffers. Even the movie’s attempts at gross-out humor—such as an extended bit in which Holmes keeps barfing into a bucket, or a sequence where he calculates the trajectory of his arcing urine in slow-mo, à la Guy Ritchie’s Sherlock Holmes—are timorous and half-assed. The trivial plot finds the detective duo in yet another battle of wits with “the Napoleon of crime,” James Moriarty (Ralph Fiennes, given only a few lines)—though Holmes believes that his arch-nemesis has been replaced by a lookalike compulsive masturbator. Because Holmes & Watson is the hackiest kind of studio comedy, they must also learn to be better friends to each other, get in touch with their feelings, and navigate a couple of romantic subplots: Watson’s crush on Grace Hart (Rebecca Hall), a “lady doctor” from Boston; Holmes’ confused attraction to her feral assistant, Millie (Lauren Lapkus), who shares his passion for eating raw Vidalia onions. Somewhere in there is an unusually young and seemingly very horny Mrs. Hudson (Kelly Macdonald); a bad musical number that goes on and on; some groan-worthy Trump jokes; a scene in which Watson tries to take a selfie with Queen Victoria; and the requisite cracks about Holmes’ drug use. (These go back to at least the mid-1910s and The Mystery Of The Leaping Fish, starring Douglas Fairbanks as a master sleuth who solves cases in a St. Vitus’ dance of nose-candy-induced agitation.) Even when Holmes & Watson stumbles into something that could, in theory, make a decent gag—as in a scene where Watson tries to dictate a drunk, late-night telegram to Dr. Hart, or a visit to the Diogenes Club that finds him shooed off to a side room for idiot sidekicks—it bungles it with bad timing and slapdash composition. “At least it’s in focus” is the lowest form of damnably faint praise one can give a movie. But Holmes & Watson doesn’t even earn that distinction. One might call it a failure on almost every level—that is, if the movie ever gave the impression that it was trying to succeed. Instead, it’s pervaded by an air of extreme laziness. It’s cheap and tacky—a bizarrely dated parody of Ritchie’s Holmes (complete with a soundalike score) poisoned with rib-elbowing topical references and puerile gags. It’s the Sherlock Holmes movie with the red “Make England Great Again” hat and the lactating Watson. It succeeds in only one respect. As a Christmas Day release that wasn’t screened in advance for critics, it managed to avoid our list of the worst films of 2018. It belongs at the top.